Welcome back for Day 2 of Stamp Highlights! 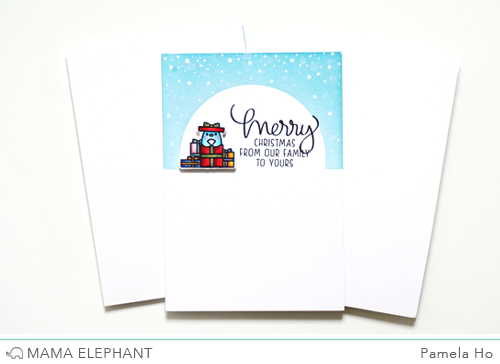 Today we are featuring Jingle Greetings with Pamela and Melania! Pamela decorated her card with the penguins and present from the Christmas Scene stamp set, finished off with a sentiment from Jingle Greetings. We love that snowy background! Deasy created adorable scene about the fun penguins on the mountains used the Snow Capped Mountain Dies. Both of these cards are absolutely adorable. Love the penguins cute little faces and the use of the Snow Capped Mountains Dies make the scene card so special. Love the backgrounds on both cards. Great designs by both Pamela and Melania. Super job ladies! Love the little penguins on their ice floes. Oh, how CUTE! 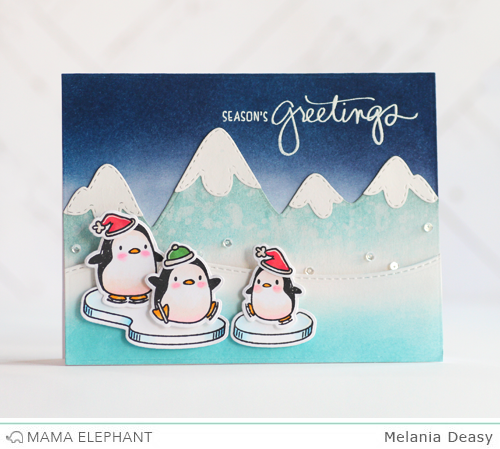 This penguin set is so versatile, and I love how Melania paired them with the snow capped mountains...Adorable card! Oh my gosh! These are both to cute for words! I would love to receive either of these in my mailbox and so would my nephew. He loves penguins (I think it started with The Penguins of Madagascar and Happy Feet) and I always make him a penguin card each year. Guess what he's getting this year? These are all too adorable! Great work girls! Too cute for words. I love them!